For the orchid genus, see Microtis (plant). For the gastropod genus, see Microtis (gastropod). For the vole genus, see Microtus. For the butterfly genus, see Microtia (butterfly). 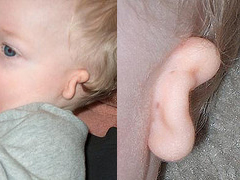 Microtia is a congenital deformity where the pinna (external ear) is underdeveloped. A completely undeveloped pinna is referred to as anotia. Because microtia and anotia have the same origin, it can be referred to as microtia-anotia. Microtia can be unilateral (one side only) or bilateral (affecting both sides). Microtia occurs in 1 out of about 8,000–10,000 births. In unilateral microtia, the right ear is most commonly affected. It may occur as a complication of taking Accutane (isotretinoin) during pregnancy. Unilateral grade III microtia (more often affecting the right ear). Grade II: A partially developed ear (usually the top portion is underdeveloped) with a closed stenotic external ear canal producing a conductive hearing loss. The goal of medical intervention is to provide the best form and function to the underdeveloped ear. Typically, testing is first done to determine the quality of hearing. This can be done as early as in the first two weeks with a BAER test (Brain Stem Auditory Response Test). At age 5–6, CT or CAT scans of the middle ear can be done to elucidate its development and clarify which patients are appropriate candidates for surgery to improve hearing. For younger individuals, this is done under sedation. The hearing loss associated with congenital aural atresia is a conductive hearing loss—hearing loss caused by inefficient conduction of sound to the inner ear. Essentially, children with aural atresia have hearing loss because the sound cannot travel into the (usually) healthy inner ear—there is no ear canal, no eardrum, and the small ear bones (malleus/hammer, incus/anvil, and stapes/stirrup) are underdeveloped. "Usually" is in parentheses because rarely, a child with atresia also has a malformation of the inner ear leading to a sensorineural hearing loss (as many as 19% in one study). Sensorineural hearing loss is caused by a problem in the inner ear, the cochlea. Sensorineural hearing loss is not correctable by surgery, but properly fitted and adjusted hearing amplification (hearing aids) generally provide excellent rehabilitation for this hearing loss. If the hearing loss is severe to profound in both ears, the child may be a candidate for a cochlear implant (beyond the scope of this discussion). Unilateral sensorineural hearing loss was not generally considered a serious disability by the medical establishment before the nineties; it was thought that the afflicted person was able to adjust to it from birth. In general, there are exceptional advantages to gain from an intervention to enable hearing in the microtic ear, especially in bilateral microtia. Children with untreated unilateral sensorineural hearing loss are more likely to have to repeat a grade in school and/or need supplemental services (e.g., FM system – see below) than their peers. It is important to note that not all children with aural atresia are candidates for atresia repair. Candidacy for atresia surgery is based on the hearing test (audiogram) and CT scan imaging. If a canal is built where one does not exist, minor complications can arise from the body's natural tendency to heal an open wound closed. Repairing aural atresia is a very detailed and complicated surgical procedure which requires an expert in atresia repair. While complications from this surgery can arise, the risk of complications is greatly reduced when using a highly experienced otologist. Atresia patients who opt for surgery will temporarily have the canal packed with gelatin sponge and silicone sheeting to prevent closure. The timing of ear canal reconstruction (canalplasty) depends on the type of external ear (Microtia) repair desired by the patient and family. Two surgical teams in the USA are currently able to reconstruct the canal at the same time as the external ear in a single surgical stage (one stage ear reconstruction). In cases where a later surgical reconstruction of the external ear of the child might be possible, positioning of the BAHA implant is critical. It may be necessary to position the implant further back than usual to enable successful reconstructive surgery – but not so far as to compromise hearing performance. If the reconstruction is ultimately successful, it is easy to remove the percutaneous BAHA abutment. If the surgery is unsuccessful, the abutment can be replaced and the implant re-activated to restore hearing. The age when outer ear surgery can be attempted depends upon the technique chosen. The earliest is 7 for Rib Cartilage Grafts. However, some surgeons recommend waiting until a later age, such as 8–10 when the ear is closer to adult size. External ear prostheses have been made for children as young as 5. Rib Cartilage Graft Reconstruction: This surgery may be performed by specialists in the technique. It involves sculpting the patient's own rib cartilage into the form of an ear. Because the cartilage is the patient's own living tissue, the reconstructed ear continues to grow as the child does. In order to be sure that the rib cage is large enough to provide the necessary donor tissue, some surgeons wait until the patient is 8 years of age; however, some surgeons with more experience with this technique may begin the surgery on a child aged six. The major advantage of this surgery is that the patient's own tissue is used for the reconstruction. This surgery varies from two to four stages depending on the surgeon's preferred method. A novel one stage ear reconstruction technique is performed by a few select surgeons. One team is able to reconstruct the entire external ear and ear canal in one operation. Reconstruct the ear using a polyethylene plastic implant (also called Medpor): This is a 1–2 stage surgery that can start at age 3 and can be done as an outpatient without hospitalization. Using the porous framework, which allows the patient's tissue to grow into the material and the patient's own tissue flap, a new ear is constructed in a single surgery. A small second surgery is performed in 3–6 months if needed for minor adjustments. Medpor was developed by John Reinisch. This surgery should only be performed by experts in the techniques involved. The use of porous polyethylene implants for ear reconstruction was initiated in the 1980s by Alexander Berghaus. Ear Prosthesis: An auricular (ear) prosthesis is custom made by an anaplastologist to mirror the other ear. Prosthetic ears can appear very realistic. They require a few minutes of daily care. They are typically made of silicone, which is colored to match the surrounding skin and can be attached using either adhesive or with titanium screws inserted into the skull to which the prosthetic is attached with a magnetic or bar/clip type system. These screws are the same as the BAHA (bone anchored hearing aid ) screws and can be placed simultaneously. The biggest advantage over any surgery is having a prosthetic ear that allows the affected ear to appear as normal as possible to the natural ear. The biggest disadvantage is the daily care involved and knowing that the prosthesis is not real. Aural atresia is the underdevelopment of the middle ear and canal and usually occurs in conjunction with microtia. Atresia occurs because patients with microtia may not have an external opening to the ear canal, though. However, the cochlea and other inner ear structures are usually present. The grade of microtia usually correlates to the degree of development of the middle ear. Microtia is usually isolated, but may occur in conjunction with hemifacial microsomia, Goldenhar Syndrome or Treacher-Collins Syndrome. It is also occasionally associated with kidney abnormalities (rarely life-threatening), and jaw problems, and more rarely, heart defects and vertebral deformities. Paul Stanley, vocalist and rhythm guitarist of Kiss, was born with grade III microtia of his right ear. ^ De la Cruz A, Kesser BW (1999). "Management of the Unilateral Atretic Ear". In Pensak M (ed.). Controversies in Otolaryngology—Head and Neck Surgery. New York: Thieme Medical Publishers. pp. 381–385. ^ a b Kountakis SE, Helidonis E, Jahrsdoerfer RA (1995). "Microtia grade as an indicator of middle ear development in aural atresia". Arch Otolaryngol Head Neck Surg. 121 (8): 885–6. doi:10.1001/archotol.1995.01890080053010. PMID 7619415. ^ Vrabec JT, Lin JW (2010). "Inner Ear Anomalies in Congenital Aural Atresia". Otology & Neurotology. 31: 1421. doi:10.1097/mao.0b013e3181f7ab62. ^ Bess FH, Tharpe AM (1986). "Case History Data on Unilaterally Hearing-Impaired Children". Ear and Hearing. 7: 14–19. doi:10.1097/00003446-198602000-00004. ^ Bess FH, Tharpe AM (1988). "Performance and Management of Children with Unilateral Sensorineural Hearing Loss". Cand Audiol Supple. 30: 75–9. PMID 3067327. ^ Nicholson N, Christensen L, Dornhoffer J, Martin P, Smith-Olinde L (2011). "Verification of speech spectrum audibility for pediatric baha softband users with craniofacial anomalies". The Cleft Palate-Craniofacial Journal. 48 (1): 56–65. doi:10.1597/08-178. PMID 20180710. ^ Verhagen CV, Hol MK, Coppens-Schellekens W, Snik AF, Cremers CW (2008). "The Baha Softband. A new treatment for young children with bilateral congenital aural atresia". International Journal of Pediatric Otorhinolaryngology. 72 (10): 1455–9. doi:10.1016/j.ijporl.2008.06.009. PMID 18667244. ^ a b Jahrsdoerfer RA, Kesser BW (1995). "Issues on Aural Atresia for the facial Plastic Surgeon". Facial Plastic Surgery. 11 (4): 274–277. doi:10.1055/s-2008-1064543. PMID 9046615. ^ Tanzer RC (1959). "Total Reconstruction of the External Ear". Plastic & Reconstructive Surgery. 23: 1–15. doi:10.1097/00006534-195901000-00001. ^ a b Brent B (1999). "Technical Advances with Autogenous Rib Cartilage Grafts—A Personal Review of 1,200 Cases". Plastic & Reconstructive Surgery. 104 (2): 319–334. doi:10.1097/00006534-199908000-00001. ^ a b c Brent B (1992). "Auricular Repair with Autogenous Rib Cartilage Grafts: Two Decades of Experience with 600 Cases". Plastic & Reconstructive Surgery. 90 (3): 355–374. doi:10.1097/00006534-199209000-00001. ^ a b Firmin F (1992). "Microtie Reconstruction par la Technique de Brent". Annals Chirurgie Plastica Esthetica. 1: 119. ^ a b Nagata S (1994). "Modification of the Stages in Total Reconstruction of the Auricle: Part I. Grafting the Three-Dimensional Costal Cartilage Framework for Lobule-Type Microtia". Plastic & Reconstructive Surgery. 93 (2): 221–30. doi:10.1097/00006534-199402000-00001. PMID 8310014. ^ Brent B (2000). "The Team Approach to Treating the Microtia-Atresia Patient". Otolaryngologic Clinics of North America. 33 (6): 1353–65, viii. doi:10.1016/s0030-6665(05)70286-3. PMID 11449792. ^ "MEDPOR Reconstruction For Mictrotia". Cedars-Sinai Medical Center. Retrieved 19 October 2011. ^ Reinisch JF, Lewin S (2009). "Ear reconstruction using a porous polyethylene framework and temporoparietal fascia flap". Facial Plast Surg. 25 (3): 181–9. doi:10.1055/s-0029-1239448. PMID 19809950. ^ Tanner PB; Mobley SR. (2006). "External Auricular and Facial Prosthetics: A Collaborative Effort of the Reconstructive Surgeon and Anaplastologist. Auricular Surgery: Aesthetic and Reconstructive". Facial Plast Surg Clin North Am. 14 (2): 137–45, vi–vii. doi:10.1016/j.fsc.2006.01.003. PMID 16750771. ^ Huston Katsanis S, Cutting GR (July 2004). "Treacher Collins Syndrome". GeneReviews. PMID 20301704. Bennun RD, Mulliken JB, Kaban LB, Murray JE (December 1985). "Microtia: a microform of hemifacial microsomia". Plast. Reconstr. Surg. 76 (6): 859–65. doi:10.1097/00006534-198512000-00010. PMID 4070453.